I assume most of you know that vermouth is a fortified wine flavored with some dry herbs, primarily wormwood. There are two main types of vermouth: Dry (or French) vermouth is white like Chardonnay. And sweet (or Italian)vermouth is red like Chianti. Dry, of course originated in France, sweet in Italy. Combine ingredients over ice in a ~10 oz rocks glass. Garnish with an orange wheel. Vary the amount of club soda to taste and occasion. Although most vermouth follows a pretty standard formula there are a lot of brands: Martini and Rossi, Noilly Prat, Gallo and Cinzano are the most common. Gallo, to me, is thin and flat compared to all the others. But outside of that they seem to be pretty similar. So I’ll buy whatever of the other three is available or on sale at the supermarket. I’ll change your mind on Manhattans. But there many other ways to use sweet vermouth. I’ve already shared the Bronx Cocktail with you. And you could just shake a little with ice and a lemon peel and strain it into a highball glass filled with ice. Garnish with a lemon twist and drink. Not bad, eh? Combining highballs in a separate glass ensures consistency. Blood orange slice adds both color and needed citrus flavor to the drink. But my favorite application for sweet vermouth is the Americano. 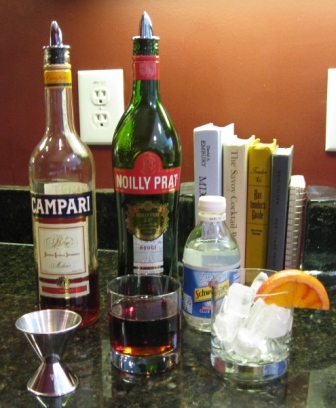 This drink from 19th century Italy is based on a bitter liquor called Campari that the native Italians would drink straight. This was a bit too much for the sweeter American palate, so they would order it on ice with sweet vermouth and club soda. Eventually the drink became known as the Americano. Fast forward 100 years and even an Americano is too bitter for most American palates. But this is my favorite summer drink and if you like IPA style beers it could be yours, too. It isn’t too sweet and can be very low in alcohol depending on club soda ratio. I make pitchers of them and sit next to the pool with a red cup on summer Sunday afternoons. But with winter closing in, let’s talk about the classic winter cocktail – the Manhattan. Each sip and I feel like I’m in a basement jazz club in Chicago listening to Thelonious Monk with one eye on the mobsters in the booth in the back corner. There’s snow on the ground, but my walk home is only 2 blocks. Stir ingredients and strain into chilled cocktail glass. Garnish with maraschino cherry. You run into a problem recreating this scene today. Okay, two problems. Monk has long been playing the upright piano in the sky. And most bars and bartenders make an inconsistent and un-tasty version of this classic cocktail. Which is why most people say they don’t like them. 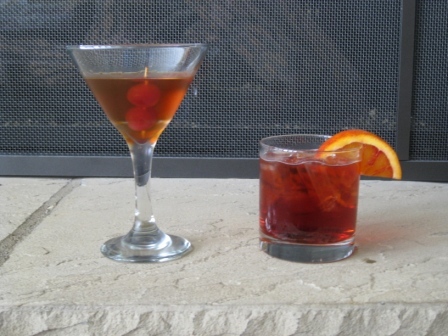 Traditionally, a Manhattan is made with 2 parts american rye whiskey and 1 part sweet vermouth. I prefer mine with a 4:1 ratio — not as dry as I like my martinis but much drier than tradition. Additionally, rye whiskey has been hard to find for a while but is making a comeback. There are a variety on most liquor store shelves these days. All are small-batch and the best I can say is that they are inconsistent. Some are quite tasty, but I’ve also spent $35 on some pretty bad whiskey. So I stick with traditional american bourbon for this drink. Because the bourbon or rye is such a large part of the drink, the quality of the ingredients matters a lot. So a very smooth bourbon like a Woodford Reserve will make a smoother Manhattan than say Jack Daniel’s. I never was a fan of hairspray in a glass, but if it’s your thing, there are a bunch of Hell’s Angels that would probably back you up. Cherries on a toothpick make for easier eating. 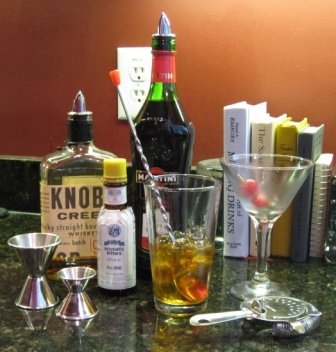 Pour spouts are $5/dozen -- the cheapest way to amke an efficient home bar. So my recommendations for bourbon? I haven’t done an official tasting, but I like Woodford, Knob Creek, and Maker’s Mark generally. Just make sure you use a straight whiskey (no Crown Royal or other blended or Canadian whiskeys please) that you like. If that’s Jack Daniel’s then so be it. Every palate is different, so try all the variations and find what you like best. Then you can solve the bar problem by ordering exactly what you want. Asking for a “4:1 Woodford Manhattan with 2 cherries” may get you a funny look from some bartenders. But most will be happy for the guidance — it beats guessing. Stir v Shake: Shaking a cocktail both chills and dilutes it as a little ice melts into the mixture. Stirring does the same thing to a lesser degree, but because it is less violent it clouds the drink less. So the rule of thumb is to stir drinks if all the ingredients are clear, alcoholic liquids and shake everything else. That would mean all Manhattans, Martinis, and Gibsons should be stirred. While I like tradition, I will sometimes shake a Manhattan if I want one slightly less strong. To stir a drink, grab your bar spoon and the glass side of your boston shaker. fill halfway with ice and pour ingredients into shaker. stir vigorously for ~30 sec with the bar spoon and strain into appropriate glass. it won’t get either as cold or as diluted as it would if it was shaken, but it should be crystal clear and tasty. This entry was posted in Uncategorized and tagged Americano, Angostura, bourbon, Campari, Manhattan, Vermouth. Bookmark the permalink.